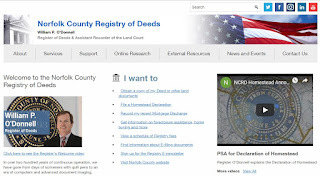 Norfolk County Register of Deeds William P. O'Donnell today reminded homeowners about the importance of filing for Homestead protection. Under Massachusetts law, a Homestead recording provides limited protection against the forced sale of an individual's primary residence to satisfy unsecured debt up to $500,000. "For most people, their home is the most important financial asset they have," noted Register O'Donnell. "If you own a home, and it is your primary residence, one way to protect it is to file a Homestead. The Homestead law also allows for the filing of an Elderly Homestead application, which defines an elder as a person who is 62 years of age or older. This protection can be increased if the elderly couple files jointly." O'Donnell further stated, "The Homestead law was significantly enhanced by an act of the Massachusetts Legislature back in 2011. Language in the new law states a valid Homestead cannot be terminated when refinancing a mortgage. Other changes include wording which states that a Homestead can provide protections for a primary home even if it is kept in trust. The definition of a primary residence has been further expanded to include a manufactured or mobile home." Homestead recordings can be filed at the Registry of Deeds for a state imposed fee of $36.00. To find out more about the Homestead law, or get a free application, please go online to the Registry's website at www.norfolkdeeds.org or contact the Registry's Customer Service Center at 781-461-6101. Register O'Donnell concluded, "A Homestead is an important consumer protection tool because it protects homeowners against the forced sale of their primary owned residence to satisfy unsecured debt up to $500,000. While the debt is still owed, homeowners will at least have the comfort of knowing that with a Homestead filed at the Registry of Deeds, their primary residence cannot be forcibly sold to satisfy most debts."